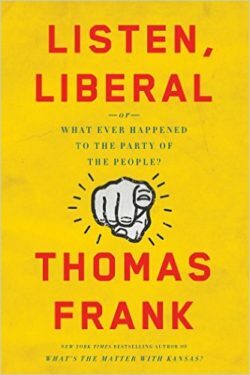 Thomas Frank talks about his book Listen, Liberal. It’s a scathing look at what’s wrong with the Democratic Party and how it got to the disastrous place it’s in right now. Then we share some our of favorite recent fiction. A fight is brewing for the heart and soul of the Democratic Party. In the wake of November’s catastrophic election, the progressive wing of the Party is mounting a serious challenge to the center-right faction that has controlled the party since at least the Carter years and possibly even earlier. They want the Democratic Party to go back to its roots in the New Deal — back when the party won election after election. And they want Keith Ellison to head the DNC; he’s said he’ll mount a strong 50-state strategy to win back America’s middle and working classes. Obama is opposing Ellison — a head scratcher for many Democrats who say the Party must either change or it will die. Maybe Obama should read Thomas Frank’s book Listen, Liberal. It poses the question, “whatever happened to the party of the people?” and sets out to answer the question with a penetrating analysis of how the Party turned away from its historic base in the working class to serve a professional and corporate elite. By doing so, the Party ceded its traditional ground to Trump, a billionaire faux populist who promised pro-working class policies he clearly has no intention of fulfilling, if one is to judge from the anti-labor, anti-Social Security and Medicare, and anti-health care billionaires with which he is packing his cabinet. This is a tragedy for which the Democrats have mostly themselves to blame, Frank says. When they threw their base under the bus of NAFTA, mass incarceration and the abolition of welfare, they destroyed the lives of millions of Americans — and reaped a whirlwind of rage in return. As a result, the so-called “party of the people” has lost not only the White House, but also (since Barack Obama was elected) both houses of Congress and has gone down to defeat in a slew of state legislatures and governorships. The Party is at a nadir — and may not survive. And yes, we know that Hillary Clinton won the popular vote and we also know that the relentless Republican policies of voter suppression and gerrymandering have stacked the deck against Democrats. But still. Listen, Liberal shows why the Democrats have been unable to marshall the large majorities they enjoyed before they turned away from the New Deal — majorities that could have overwhelmed all the tricks Republicans have thrown at them. Thomas Frank is the author of Pity the Billionaire, The Wrecking Crew, and What’s the Matter with Kansas? A former columnist for The Wall Street Journal and Harper’s, he is the founding editor of The Baffler. 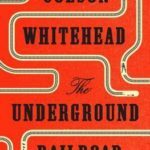 Colson Whitehead’s The Underground Railroad is a searing novel about slavery with a twist on reality — the underground railroad isn’t merely a network to bring slaves into freedom, but an actual railroad underground. Otherwise, the realism is almost too much to bear, as we follow the story of a young woman who manages the nearly impossible — to escape from the ghastly cruelties of slavery. The Underground Railroad won the National Book Award in 2016. 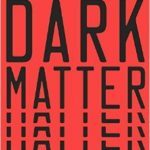 Another wonderful novel — a sci fi thriller driven by the physics of parallel universes — is Dark Matter by Blake Crouch. It follows a character who is thrown into universes that are parallel to his own and has to find his way back to his original universe — and his family. It’s a terrific romp that educates the reader about astrophysics while asking thorny questions about identity. 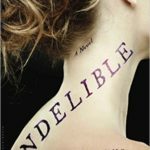 And finally there’s Indelible, a debut novel by Adelia Saunders that comes out on January 17. It has three protagonists: a young woman who was born with the ability to see facts about people’s lives, past, present and future, written on their skin; the young man she falls in love with, a history intern working in the Paris archives of a medieval church; and his father, who is looking for clues to the life of his own mother, a famous writer who died of a terrible self-inflicted wound. The novel is tautly plotted and the characters and writing are memorable.